Speaking of Norse gods and hobos… [Announcements!] | Marie Loughin's "I WANNA BE . . ."
For those who don’t know, flash fiction is very short fiction. I’ve seen different definitions, from 100 words to 1000 words. Sommer set the word count limit to 350 for this post (a little less than a page and a half). My writing friends will be shocked that I managed to come in under the wire. The post includes a discussion of my approach to writing the story. Here’s another exciting announcement: I am guest posting at Wicked & Tricksy on Friday, December 22 (this week). I’ll be discussing writing with multiple viewpoints. And yet another exciting announcement: I’m guest posting at Jaye Manus’s blog on Thursday, December 21. I’m saving the nature of that post as a surprise, mostly because I haven’t figured out what to write, yet. So go buy it. Right now. Then read it. If you read (and enjoy) Valknut: The Binding and want to help spread the word, here are some simple ways to do it. Kidnap your friends, neighbors, coworkers, family, and the skinny, greasy-haired kid that works at the A&W. Tie them up, tape their eyelids open, and make them read the book. Word of mouth is the very best sales tool. However, it doesn’t work if the author is the one running around saying how great the book is. People would probably think she’s biased. Post a Customer Review wherever you’ve purchased the novel. Honest reviews are appropriate. “Like” the book at the top of its Amazon page. Again, please don’t feel obliged to “like” the book if that would be a lie. Tagging and “liking “ help increase the novel’s visibility at Amazon. The more people who agree with the tags, the higher the book will appear if someone searches on a tag. I’m not sure how “likes” work, but I hear they’re good for you. The number of reviews affects whether book bloggers will read and review my novel. A reviewer doesn’t want to waste time reading and reviewing a novel that only the author’s mother loves. These tips don’t just apply to my book. They go for any book you buy online, especially new or obscure writers who don’t get their publishing house’s love and attention. It’s a good way to help ensure your favorite authors continue to publish. This entry was posted in Marie's Fiction, Urban Fantasy, Writing and tagged Amazon, Flash fiction, Kindle, Marie M. Loughin, Norse mythology, Short story, The Binding, Valknut: The Binding. Bookmark the permalink. Oh, that would be awesome 🙂 Thanks, Shannon. and…that was supposed to be “reading time”. Thank you again for the terrific guest post, Marie. Now I’d love to see what you do with Loki. Or maybe Freyja as a pole dancer. Heh. Not sure how I’ve been missing posts. I’m subscribed. Will have to check my archived emails. Anyway, loved your flash (that sounds a little obscene 🙂 ) I love (and conversely) hate the challenge of bringing a flash piece down to word count when it comes in over. It’s such an amazing exercise in tightening up the writing and really figuring out what is essential (but I’ve only managed 1000 word flashes). 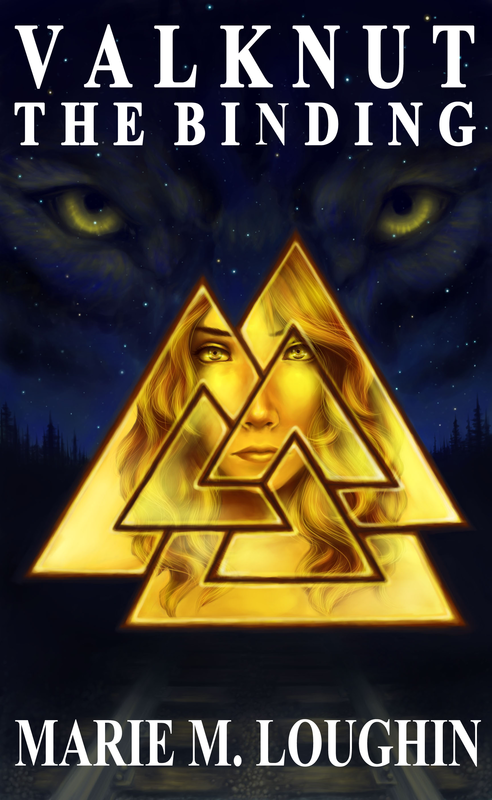 If that piece was any indicator, I look forward to Valknut (but it will probably be awhile. About 20 minutes a day just before falling asleep is my “free reading time,” and I have a few books ahead in line). Great advice for your readers for helping authors they like. Oh, and thanks again for the review (I tweeted my thanks yesterday and will be plugging your blog in my post this friday).